Anyone who has attended CeBIT Australia event knows that the event is all about meeting target audience, solve business pain areas by talking to vendors, networking, meet with industry leaders, meet influencers, know your competitors, know about latest tech trends and innovation and what not. CeBIT Australia is one of the largest tech events held for 3 days. So how can you find whom you want to meet and where you find the solutions you are looking for. So after doing much research, below we have listed some companies that you can possibly look out to visit in CeBIT Australia 2018. Social media existence and engagement is one of the primary necessity of each and every organization and Brolly is doing best in this domain. Brolly knows that conversation is the key between you and your target audience and it also provide you a platform to effortlessly connect with your target audience while providing a secure environment. So visit Brolly in CeBIT Australia 2018 for social media engagement solutions is definitely worth for your business. Have you ever thought of leaving home without your smartphone? What you do first after waking up….Check your mobile….right? So saying that smartphone is one of the most important part of our life will be justified. One of the top mobile app development company CDN Solutions Group is exhibiting in CeBIT Australia 2018 for the 9th consecutive time to let you know the future of smart mobility. Yes, CDN Solutions Group knows the importance of apps in personal and professional life. Of course you have mobile app or custom software solutions for your business, but are they working exactly what you are expecting from them? Or are they smart enough and making your business and life hassle free? CDN Solutions Group knows how, where and what technology to implement for making solutions less costly and fully organized. Meeting CDN Solutions Group in CeBIT Australia 2018 for all your software and mobile app development concerns will be your brave decision. Flexible, reliable, affordable and dedicated cloud solutions is every business’s need today and OVH Australia is exactly delivering the same over decades. Meet OVH Australia for all your cloud solutions requirement in cloud zone. Zoho is definitely not a new name for you all, its a well known platform of online productivity tools and saas applications. The company have over 30 million users worldwide. You can meet them in CeBIT Australia 2018 for all your requirements. Dynamic Design is a well known name when it comes to provide services for network inventory and resource management for the telecommunications and utilities markets. Are you also from Telecommunication and Utilities industries? Then you must meet Dynamic Design in CeBIT Australia 2018 during the event. 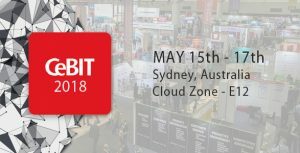 CeBIT Australia is going to be held in International Convention Centre Sydney during 15th – 17th May 2018.